Coupling the state of the art X5 Wax Dome Clearomizer with a powerful Variable Voltage Pass-through battery and adding a hard-sided eGo zippered case creates a fantastic kit that will give you everything you need to enjoy a luxurious, relaxing vaping experience. We love having choices and even more so, we love giving you choices; therefore not only are you able to choose a color for your case from a myriad of colors and patterns, you may also choose which battery size and strength will suite your needs. 1 - eGo CASE (Choose One):Solid colors or designer patterns. The X5 is a top selling wax dome clearomizer with a streamlined look and is easy to use and maintain. The flavor you get from this awesome clearomizer is unbelievably pure. This is because it is made of ceramic and glass, which helps with purity. The vapor production from an inhale will surprise and amaze you. Clouds of thick, tasty vapor will bring you plenty of satisfaction and pleasure. 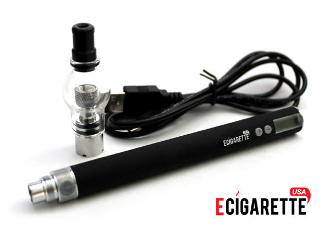 Though you will be wowed by the flavor and vapor from this little clearomizer there is minimal to no scent. Also, you are able to replace the heating coil as needed. The tank itself is made of Pyrex glass, which means it is durable but CAN break so keep this in mind during storage and use. The bowl (or head) is made of steel and lined with ceramic. Though this great clearomizer comes with clear glass and has no other color choices, you are still able to customize your X5 by replacing your mouthpiece with any 510 drip tip. We have several color choices available.This clearomizer is 510 threaded so it will work on all eGo batteries. This clearomizer is made to use with wax or concentrate. NOT TO BE USED WITH E-LIQUID. It also needs to stay upright. Though the seal at the bottom holds tightly and works very well, the wax or concentrate, when hot, can liquefy and may escape from the mouth piece. Typically, the bowl/head will last approx. 800 puffs. Though this can vary depending on length and depth of inhale, and also whether or not you take care of the inner coils when filling the bowl. With any of our pass through batteries, they come with an LCD read-out screen, allowing for precision setting of voltages, ranging from 3.0-6.0V, with accuracy within 0.1 V. Other features include a lock-in device for locking in your favorite voltage setting for ultimate flavor and vapor. The pass through feature allows you use the battery while it's charging. These batteries were created using a Li-polymer cell, making them the safest models available and allowing you to vape with confidence.